Jordaan is one of my favorite neighborhoods in Amsterdam and I spent a recent Thursday afternoon walking around there enjoying the city. 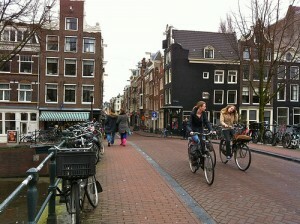 I started by walking down Runstraat. I was looking for a simple lunch so I stopped in at De Kaaskamer, which was offering a daily baguette for 5 Euros, why not? It was a local ham and soft goat cheese served on half a dark baguette. De Kaaskamer is one of those really great cheese shops where they sell hundreds of cheeses and the staff know everything about the different cheeses so they can point you in the right direction. The sandwich was great. 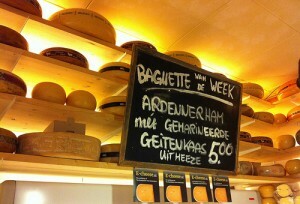 I’m looking forward to a Dutch cheese-tasting evening at home! Then on to the Cafe de Pels just down the street, a cafe we visited before. Very nice coffee, newspapers, darkish interior, and totally comfortable. More walking, I was happy to find the great restaurant called t’ Stuivertje on Hazenstraat 56 that we enjoyed so much last time we visited Amsterdam. I was glad to see it was still in business. 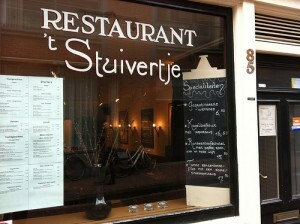 Here’s my review of Bistro ‘t Stuivertje from last time. I also found a very nice looking pizza place called pazzi (see my review) and a cool looking cafe, but to be honest, there seem like a million cool looking cafes in Amsterdam and especially in the Jordaan (maybe that’s why I like it?). After walking around a little more it was happy hour, as my mother likes to say, and so I stopped in at a nice cafe at the corner of Elandsgracht and Prinsengracht overlooking the canal. 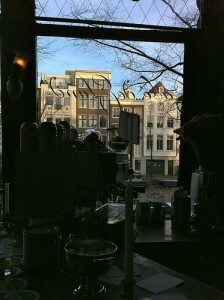 I had a nice Heinekein beer and enjoyed the sun setting in the windows across the canal. 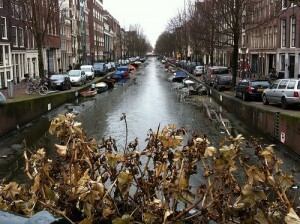 All my Jordaan photos on Flickr. Where would you be able to buy this old goat’s cheese from Herbert Nyland in the US? Thanks for asking. I think you can have cheese shipped to the US, here’s the Kaaskammer website page for cheese from Herbert Nyland, perhaps you would have to ask for the particular one I mentioned because this one looks like it’s only a little more than one year old. But the people at the store are great, so send them an e-mail with questions.